Download a free PDF version of the guide or order a printed copy by paying £2 to cover post and packaging. 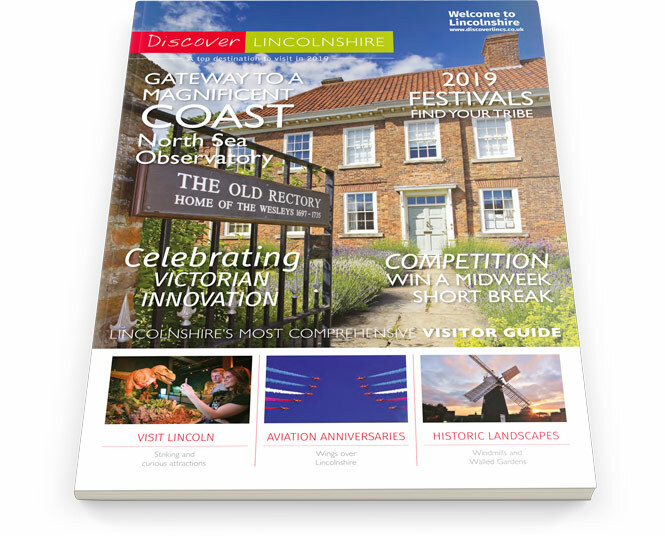 The rich variety of our beautiful county makes it a joy for visitors and residents alike and we hope in the pages to follow to whet your appetite to visit Lincolnshire in 2019. From the vibrancy and rich cultural heritage of the city of Lincoln to the stunningly beautiful expanses of the coastline, this is a county of contrasts. Our features highlight the new North Sea Observatory, a visitor centre welcoming walkers, wildlife enthusiasts and holidaymakers as a gateway to the Coastal Country Park. We celebrate some of the county’s innovators and innovations of the Victorian era; the rapid progress of today’s digital technology reflecting that of the Industrial Revolution. Many festivals, exhibitions and events this year will reference cultural themes of the 19th century which still resonate today. Magnificent landscapes, both natural and manmade can be found in the tranquillity of the Wolds and Fens as well as on the estates of some of Lincolnshire’s grand country houses and stately homes. A warm welcome to Lincolnshire. Kindly sponsored by Elms Farm Cottages, Hubberts Bridge.